A long-time skeptic of Nektar Therapeutics on Wall Street remains cautious after Monday’s 42 percent plunge, the worst performance for an S&P 500 Index member in more than five years. Evercore ISI analyst Josh Schimmer has stuck to his “in-line” rating even as the stock skyrocketed this year. He remains unconvinced that Nektar’s experimental cancer drug adds benefit to Bristol-Myers Squibb Co.’s Opdivo, as an update on Saturday showed patient responses have decreased. Worse yet, the data in patients with melanoma look “very reminiscent” of Incyte Corp.’s epacadostat, the year’s biggest failure in biotech, Schimmer wrote in a note to clients. Epacadostat “is not an active drug,” he said. Meanwhile, the stock’s 10 buy-rated analysts have argued that the data are still maturing and responses could improve over time. 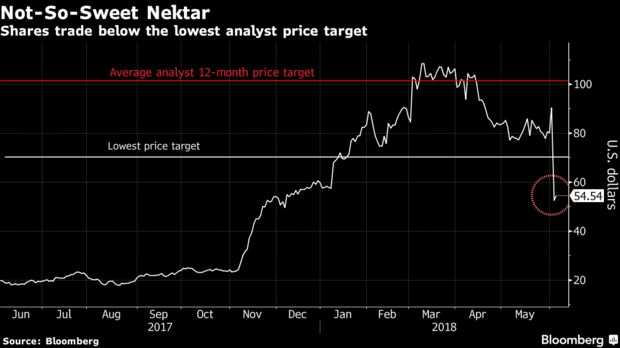 Piper Jaffray analyst Tyler Van Buren, who holds the highest price target on the stock, said in an interview that the recent selloff is a buying opportunity ahead of November’s Society for Immunotherapy of Cancer meeting, when Nektar is expected to release updated findings. Schimmer says that while there’s a possibility the data may get better, “it will take a dramatic increase to give us confidence in the incremental value of this program.” His price target of $70, while the lowest among analysts tracked by Bloomberg, still implies 26 percent upside to the current price. He’s rated the stock the equivalent of hold since starting coverage in August.